Sponsor: Strathmore Paper Co. Production Co.: Kalem Company. Transfer Note: Copied at 14 frames per second from a 35mm print preserved by the National Museum of American History, Smithsonian Institution, from source material provided by EYE Filmmuseum. New Music: Michael D. Mortilla. Running Time: 11 minutes. Making High-Grade Paper was produced by the Kalem Company, a studio better known for its feature films. This example of Kalem’s industrial film efforts featuring the Strathmore Paper Company was shown in theaters as well as business settings. Strathmore executives believed it would prove of particular interest to those involved in the advertising and printing trades—their primary clients. As announced in the journal The Printing Art (1914), Strathmore’s advertising department prepared a circular that encouraged printers’ and advertisers’ organizations to arrange special screenings of the film that they could attend as a group, presumably to facilitate discussion. The company also offered to arrange showings of the film in connection with a lecture on papermaking that apparently it had developed before the film was produced. “Strathmore” was a brand name in use from the 1890s by the Mittineague Paper Company of West Springfield, Massachusetts. The firm was owned by Horace A. Moses, who later purchased the nearby Woronoco Paper Mills and merged the two entities into the Strathmore Paper Company in about 1911. The brand name and its symbol, the thistle, represented the owner’s personal regard for Scotland; Strathmore means “large valley” in Gaelic. In 1914 Moses opened an impressive new mill with a large, state-of-the-art paper machine, and this likely is the facility shown in the film. Throughout its corporate existence, the Strathmore Company emphasized the firm’s commitment to fine papermaking. Making High-Grade Paper served that agenda by picturing each step of the process, beginning with a view of the clear local water and the quality of the rags used as raw material. 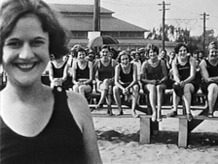 Through close-ups and tight shots focused on individual workers, the film demonstrated the attention to detail practiced by the company’s personnel, and it also recognized the firm’s employment of women. Owing to losses incurred over time, some sections of film are missing or misidentified, but what remains offers a good idea of most of the processes involved, including sorting, washing, cutting, and beating the rags into a watery pulp that flowed onto the moving wire screen of the huge paper machine. As the water drained away, the pulp formed a continuous web that could be passed through several pairs of rollers. These extracted more water and finally wound the damp paper onto large heated drying rolls. Employees then turned to the finishing operations of sizing, cutting, pressing or “calendering,” as it’s known in the paper trade, and final inspection of the sheets. The featured paper, “Strathmore Parchment,” was used for high-grade letterhead and business stationery. Strathmore worked in association with Rag Content Paper Manufacturers, which promoted the use of quality papers, those made from rags. Much of the paper produced at the time was made from wood pulp, which resulted in cheaper but much less durable paper. Pulp papers became brittle and were prone to rapid yellowing or fading. Rag papers were stronger, noted for durability and for “impressiveness,” according to the marketing materials produced by their manufacturers. Strathmore was a leader in the effort to promote the use of fine papers. The company emphasized paper’s important role in the effectiveness of printed pieces for marketing and advertising. Over the years the firm employed the best graphic designers for its own marketing efforts, beginning with Will Bradley in the 1890s and going on to include work by T.M. Cleland, W.A. Dwiggins, and Walter Dorwin Teague, among others, into the 1930s. These artists brought out the best features of papers that performed well and provided high-quality expressive products for advertising many types of businesses. The booklets, fliers, and sample books they designed demonstrated Strathmore’s papers to their best advantage and offered ideas and suggestions to potential clients. The 1914 film served in much the same way. It informed clients and the public how the product was made in a modern facility by skilled workers using the best equipment and clear water, in this way demonstrating the firm’s commitment to quality. Making High-Grade Paper was preserved in 2016 at Colorlab Corp. using a 35mm nitrate print from EYE Filmmuseum. The intertitles were translated from the Dutch and are modern re-creations. The work was supervised by the National Museum of American History, Smithsonian Institution, and funded through a National Endowment for the Humanities grant secured by the NFPF.